Magsadya lamang po sa tanggapan ng DOLE o Bureau of Labor and Employment, sa inyong lokal na munisipyo at sa iba pang sangay ng gobyerno upang kayo ay magkaroon ng pagkakataon na magamit ito. Libre po ang gumamit ng ating Kiosk at dito niyo makikita ang ibat'ibang kaalaman na makatutulong sa inyong paghahanap ng trabaho. 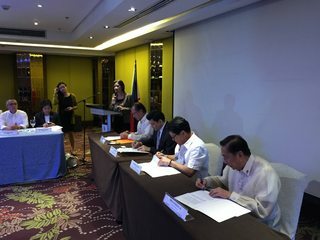 The Department of Labor and Employment (DOLE), together with Servicio Filipino Group of Companies (SFI Group of Companies), Employers Confederation of the Philippines (ECOP) and The Philippine Chamber of Commerce & Industry (PCCI) signed a Memorandum of Understanding (MOU) to become partners in the implementation of the nationwide Philippine TalentMap Initiative (PTMI) and PhilJobNet. BLE Director Nikki Tutay delivers the introductory remarks for the memorandum signing during the event. As part of SFI Group of Companies' advocacy to improve the Filipino workforce, they provided assessments grant to DOLE, PCCI, and ECOP in order to help the government and employers gauge the strengths and weaknesses of our current and future workforce. This will help government agencies, private organizations and institutions to develop appropriate programs to improve employability of students, current and future workforce. The initiative hopes to include more work sectors and industries nationwide. 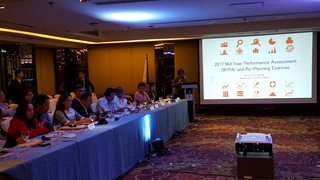 Leaders from DOLE, SFI Group of Companies, PCCI and ECOP gathered in Bayleaf Hotel at Intramuros last July 26 2017 during the opening program of The Department of Labor and Employment's annual Directors' meeting. Headed by Labor Secretary Silvestre Belo of DOLE, Mr. Luis Alberto Anastacio- CEO & President of SFI Group of Companies, Mr. George Barcelon- President of PCCI, and Mr. Sergio Ortiz-Luis Jr.- Honorary Charmain of ECOP, sealed the year long agreement to have their constituents and respective employer members use the PTMI assessments and the government's official job portal, PhilJobNet. Seated from left to right: Mr. George Barcelon President of PCCI, Mr. Luis Alberto Anastacio CEO & President of SFI Group of Companies, DOLE Sec. Silvestre Bello III and Mr. Sergio Ortiz-Luis Jr. Honorary Charmain of ECOP. As part of SFI Group of Companies' advocacies, they provided the assessments grant to DOLE, PCCI, and ECOP in order to help the government and employers gauge the strengths and weaknesses of our current and future workforce. This will help government agencies, organizations and institutions in developing appropriate programs to improve the Filipino workforce. The initiative hopes to include more work sectors and industries nationwide. For more information about the Philippine TalentMap Initiative and how you can participate as an organization or institution, you may visit www.talentmap.ph. 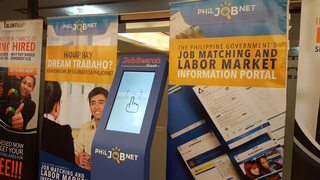 PhilJobNet is the government's official job portal that also provides the latest Labor Market Information for Jobseekers and Employers which is maintained by the Bureau of Local Employment. Having no age restrictions is truly a progressive shift in the workplace everybody is longing for. You don't have to worry if you are too old for a job - as long as you are suitable to do it in terms of skills and other qualifications needed by the employer. The Department of Labor and Employent made some rules and regulations about age discrimination in the workplace, which has been referred to as the "Anti Age-Discrimination in Employment Act". It clearly states that an individual should be accepted or rejected for a position because of his or her abilities, skills, and knowledge about the job, and not because of his or her age. This Department Order (DO) also states that an employer should not post any restrictive ad or announcement that limits the age limit of a certain job ad, it also said age should not be a hindrance for promotion and acceptance in a company. For more information about this republic act, please visit this link. 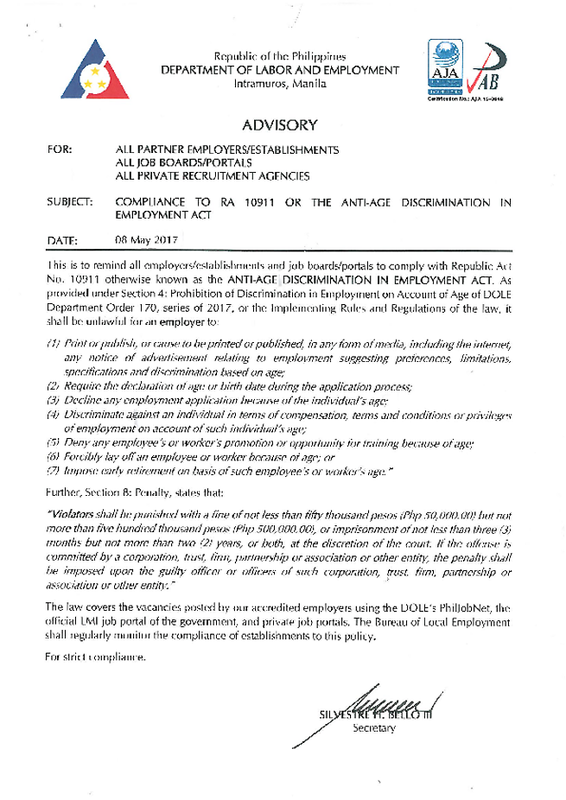 In addition, every employer needs to be aware of the specific guidelines with regard to the anti-age discrimination in employment act, and in order to comply please refer to the document below from the Department of Labor and Employment. (7) Impose early retirement on basis of such employee’s or worker’s age. If you would like to apply for these careers but lack the necessary skills to do so, we have good news for you! TESDA (Technological Education and Skills Development Authority) is offering free trainings that can give you a headstart with these top in-demand jobs to get you employed immediately since there are plenty of entry level positions available for these jobs. This job vacancy has always been in high demand but the companies do not always get to fill their job openings mostly because many of the applicants do not qualify. In order to fill the gap, our government provided free call center training to the public so many can take advantage of these job opportunities. TESDA offers free training programs for basic call center skills with a number of their partner institutions. To know more about the available schedules and locations, please click this link. There are many job openings on our job portal for beauty consultants at the time of writing. If you would like to take advantage of these job opportunities and do not have the skills yet but is interested in becoming a beauty consultant, the government has prepared technical skills training for you so you can get the jobs that are posted on PhilJobNet.gov.ph. Another in-demand job on PJN are food servers. This job usually involves taking food orders, serving it, cleaning and preparing the tables, collecting payments and making sure that guests are happy with the service. In the food industry, they are the first point of contact. Applicants for this job should be presentable, customer service focused and has an ample training as a food server. You can even get a headstart by enrolling with TESDA's online training certification course available in their E-TESDA.gov.ph's Waiter Servicing online course here. You may visit your nearest TESDA office or you may log in to their website to learn more about the available courses that we listed above. You can find their website at http://www.tesda.gov.ph/Home and their regional office contact page at http://www.tesda.gov.ph/Directory/Regions. If you're interested to apply for TESDA's scholarship program for various skills training, you may head over to this link to sign up - http://www.tesda.gov.ph/Barangay/. The Department of Labor and Employment, in partnership with the Department of Trade and Industry, are highlighting three major aspects for this year's yearly celebration namely- jobs, business, and livelihood dubbed as the Trabaho, Negosyo, at Kabuhayan Job and Business Fairs. The TNK Job and Business Fairs will happen all over the country starting May 1, and the entire ‘Labor Month’. It will focus to generate more employment opportunities for everyone especially in the provinces. The job fair also aims to increase awareness of entrepreneurship down to the all levels of Philippine society. Starting April 20 to 29, before Labor Day, there will be simultaneous TNK job and business fairs in CALABARZON at Robinson's Place, Antipolo City, Calamba Ciy Hall; Activity Center, Tanay Municipal Hall; San Jose Municipal Gymnasium; Mainsquare Mall, Bacoor City; Batangas City Sports Coliseum; at Calamba City, Laguna. There will also be an upcoming TNK job and business fair on May 5 at Vista Mall, Balanga City, Bataan. Where DOLE and its attached agencies will provide services i.e. pre-employment services like coaching, career information, seminars and training, labor standards enforcement, dispute resolution, and livelihood assistance. There will be a forum for workers in the formal sector, highlighting success stories of program beneficiaries. We will also explore the possibility of forging MOA's between DTI and DOLE at the regional level for sustainability of livelihoods. PRE-REGISTRATION for JOB FAIRS THROUGH PHILJOBNET. 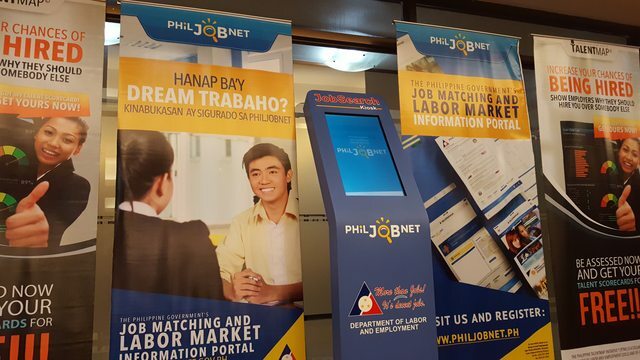 In line with the observance of Labor Month, we encourage everyone to register on the Philjobnet job portal to increase the chances of getting hired, job seekers can take advantage of the job fair registration capability of our website to increase their visibility with employers, simply click here. Employers should also grab this opportunity to join the official job fairs for free so they can participate in the annual labor day activities, provided they have been accredited and have business presence in their respective regions. Nagtapos ang mahigit sa limang daang (500) kabataan ng JobStart Philippines na ginanap sa UP Diliman Quezon City noong March 14. Nakapanayam namin ang ilan sa kanila upang magbigay ng pahayag, tinanong namin sila kung ano ang kanilang buhay bago sila sumali sa programa, at kung ano ang naidulot nito nang makatapos sila sa anim na buwan na pagsasanay. Panayam kay Ms. Kelly Anne C. Aro, JobStart graduate of General Trias, Cavite. Paano mo nalaman ang programang JobStart ng Gobyerno? Sa Munisipyo po ng General Trias, last year April. Ilang months ang training ninyo sa Jobstart? Meron ba kayong allowance habang isinasagawa ninyo ang training? Ano ang ginagawa mo bago ka magsimula sa Jobstart? Nagstop po ako sa pag-aaral, inalagaan ko po ang lola ko, sa bahay lang po ako. Ano ang mga naitulong ng JobStart sa iyo? Natulungan po akong maboost yung confidence, natuto po akong tumayo sa sarli paa, at naisip ko po na walang madaling trabaho kaya dapat pagsikapan. Ngayon na nandito ka at ga-graduate kayo anong pakiramdam mo? Masaya po, kasi may natutunan talaga ako, tsaka yung akala ko na dati na hindi ko kaya kaya ko pala. Five years from now saan mo nakikita ang sarili mo? Gusto ko po sanang magpulis. Mag-iipon po ako, para makatulong na rin sa pamilya ko. Panayam kay Mr. David Michael Menina, JobStart graduate of Caloocan City. Paano mong nalaman ang programang JobStart? Nalaman ko po sa pinsan ko na nagtatrabaho sa Caloocan City Hall. Before JobStart anong ang pinagkakaabalahan mo? Nagresign po ako sa trabaho, tapos nag aaply po ako sa mga company, at dahil po hindi pa ko natatanggap sa trabaho nag apply po ako sa JobStart. Ano ang naitulong sa iyo ng JobStart? Naboost po ang confidence ko, pagdating po sa interviews kung paano sagutin yung mga interview questions. Tapos sa personality, kung ano ang dapat mong ipakita sa mga katrabaho mo. Pati paghandle ng pressure at time management. Ano ang trabaho mo ngayon? OIC (Officer-In-Charge) po ako ngayon sa Molecular Ice Cream running for Supervisor. Ano ang pakiramdam mo ngayon na ga-graduate ka na sa JobStart? Overwhelmed po ako, na kasama po ako sa proyektong ito, nakatulong po ito hindi lang sa paghahanap ko ng trabaho kundi para mas maboost pa yung personality ko. Siguro kung magstick po ako ako dito... magiging MANAGER po ako. Wala talagang tatalo sa karanasan. Ito ay napatunayan ng 62 taon na si Rolando Sardinio nang mapabilang siya sa hired-on-the-spot (H.O.T.S) sa ginanap na Trabaho, Negosyo, at Kabuhayan (TNK) Job Fair sa Riverbanks Mall sa Marikina City kamakailan. Si Sardenia, na may mahigit na 40 taong karanasan bilang pintor, ay kinuha ng Omniworxs Manpower Agency. Dahil tiyak na pasok na siya sa trabaho, siya ay pinayuhan na mag-sumite ng kinakailangang dokumento, tulad ng NBI clearance at Barangay Certificate. “Narinig ko sa radyo na may job fair kaya nagbakasali ako. Nang tanungin nila ako sa interview kung ano daw ang bentahe ko sa mga batang aplikante, sabi ko yung karanasan ko,” ani Sardenia na nagsimulang maging pintor ng mga bahay at gusali ng siya ay 21 taon pa lamang. Si Sardenia ay isa sa mga 191 aplikante na hired-on-the-spot sa ginanap na job fair. Ang job fair ay bahagi ng dalawang-araw na TNK program ng Department of Labor and Employment (DOLE) at Department of Trade and Industry (DTI). Sa ginanap na TNK Job Fair, nagkaroon ng oportunidad na makapag-trabaho at makapag-negosyo ang mga manggagawa , kasama na ang mga umuwing overseas Filipino workers, sa Marikina City at mga karatig na lugar. 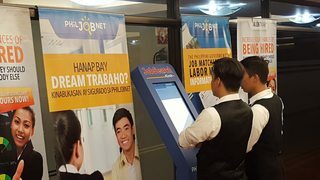 Tinatayang 1,675 aplikante ang lumahok sa TNK Job Fair nag nag-alok ng 25,000 trabaho. Sa nasabing bilang ng mga aplikante, 926 ay mga babae at 749 ay lalaki. Nagsagawa din ng seminar ang TNK tungkol sa mga pagsasanay, karapatan ng manggagawa, pangkabuhayan, at pagsisimula ng maliit na negosyo noong Marso 3 na dinaluhan ng 1, 244 participants. May 20,000 trabaho ang inalok ng 97 kompanyang lumahok sa jobs fair. Sa unang araw ng job fair, nilagdaan ng DOLE, na kinatawan ni Assistant Secretary Alex V. Avila, DTI Assistant Secretary Ruth Castelo, at Marikina 1st District Congressman Bayani Fernando ang Declaration of Commitment na sumisimbolo sa pangako ng mga kalahok na ahensiya na kanilang ipagpapatuloy ang sinimulang TNK. Ang TNK ay may temang, “Kasipagan, Katapatan, Kagalingan, Karangalan (4Ks) para sa mga Ganado sa Pag-asenso. Age doesn’t matter when it comes to employment. Ayon sa batas, walang employer ang maaring mag publish ng documents na may pagtukoy sa batayan ng edad sa pagtatrabaho, according to DOLE Secretary Silvestre Bello III. Napirmahan na nuong Feb 2, 2017, ang Department Order No. 170, which provides the implementing rules and regulations of Republic Act 10911 or the Anti-Age Discrimination Act. Ipinahayag din ni Secretary Bello na ipinatutupad na ito sa lahat ng employers, publishers, labor contractors or subcontractors and labor organizations. Labag sa batas na mag print o publish ang mga employer in any form of media including the internet, or kahit ano mang advertisement na related sa employment suggesting preferences, limitations, specifications and discrimination based on age. Labag din sa batas na manghingi ang employer ng requirements na nangangailangan ng declaration about sa age or date of birth sa pag process ng application. Bawal din tanggihan ang application sa trabaho dahil lamang sa edad ng aplikante. Sakop din nito ang pagbabawal na ipagkait ang promosyon or training dahil lamang sa katandaan ng aplikante at empleyado. Labor contractors or subcontractors are prohibited from refusing employment referrals or discriminate against any individual for the same reason. May multang P50,000 at hindi hihigit sa P500,000 at pagkabilanggo na hindi bababa sa tatlong buwan at hindi hihigit sa dalawang taon ang maaring kaparasuhan sa mga lalabag dito. For the complete published information about the Anti-Age Discrimination Act, please go to this link. 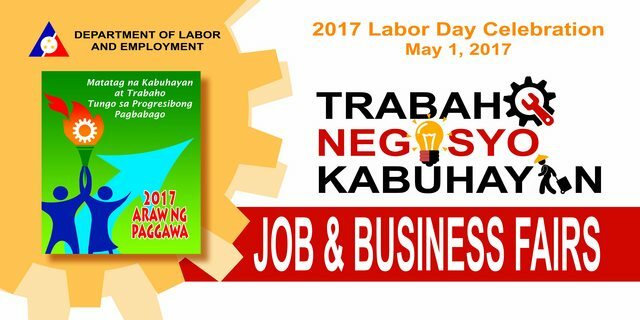 The Department of Labor and Employment together with the Department of Trade and Industry, announced last January 23, 2017 the Trabaho Negosyo Kabuhayan caravan. Ginawa ito upang para matulungan ang mga job seekers at ang mga aspiring entrepreneurs na gusto ng pag unlad sa kanilang kabuhayan. Para saan nga ba ang Trabaho Negosyo Kabuhayan Caravan? Ang DOLE at DTI ay gumawa ng isang event na tinatawag na Trabaho Negosyo Kabuhayan Caravan na magbibigay ng opportunity para sa mga individual na gustong paunlarin ang kanilang buhay. Ito ay ginawa upang magbigay ng trabaho para sa mga individual at bihasain ang isang entrepreneur para sa ikauunlad ng kanilang negosyo. Ito ay mabubuo sa pamamagitan ng Job fair, career and employment coaching and activities at mga gawain na may posibilidad na tulungan ang isang entrepreneur sa kanilang komunidad. Ang unang Trabaho Negosyo Kabuhayan Caravan ay magaganap sa Marikina. Ang dalawang araw na event na gaganapin sa darating na March 3 and 4. Magkakaroon pa muli ito sa May 1 sa araw ng labor day at June 12 Independence day. Ang Expected na trabaho na maaaring makita sa event ay more on manufacturing, food processing, construction, tourism, Information Technology-Business Process Management (IT-BPM), transportation and logistics, and retail trade na under ng isang blueprint company. The Department of Labor and Employment (DOLE) urged returning overseas Filipino workers (OFW) who are licensed teachers to practice their teaching profession and become public school teachers in the country. Under the program “Sa Pinas, Ikaw ang Ma’am/Sir (SPIMS),” OFWs who passed the Licensure Examination for Teachers may apply for teaching positions and be employed with the Department of Education. SPIMS is a reintegration program for OFWs who had returned in the last three years, and had teaching experience in the last five years. Those who have teaching experience beyond five years, or have no teaching experience at all will need to undergo an online refresher course. Labor Secretary Silvestre H. Bello III said the program aims to provide decent and sustainable work for returning OFWs as public school teachers. Bello said the program has helped ease the country’s insufficient supply of public school teachers, especially in the provinces and remote areas in the country. “The program has again benefited new set of former OFWs who are now teachers. We are glad for the beneficiaries because they are already back for good, closer to their families and loved ones and they now have regular teaching positions in their respective hometowns,” he said. DOLE-7 Regional Director Exequiel Sarcauga reported that a total of 19 OFWs in Central Visayas have benefited from the program also meant to reverse out migration by enhancing their skills. The new SPIMS beneficiaries formerly work as teachers and household service workers in Thailand, Hong Kong, China, Singapore, United Arab Emirates (UAE), and Turkey. Sarcuaga said the beneficiaries are given Teacher 1 (Salary Grade 11) plantilla positions after having passed and complied with all the needed requirements. Five of the former OFWs who hail from Cebu are now teaching in the public schools of Cebu City, Madridejos, Borbon, and Lilo-an in Cebu. Fourteen beneficiaries, who are residents of Bohol, are now deployed in public elementary and high schools in Dagohoy, Trinidad, Danao, Tubigon, Loay, Cortes, Lila, Carmen, President Carlos P. Garcia, Talibon, and Mabini in Bohol. DOLE, through the National Reintegration Center for OFWs (NRCO), implements SPIMS together with DepEd, the Professional Regulation Commission (PRC), Commission on Higher Education (CHED), Technical Education and Skills Development Authority (TESDA), and the Philippine Normal University (PNU). Interested applicants may visit the website at www.nrco.dole.gov.ph while online application forms can be accessed here. Labor and Employment Secretary Silvestre H. Bello III today launched the DOLE Hotline 1349 which will provide workers and employers with 24/7 service on all labor and employment related queries. "This is the Department’s contribution to ensure prompt and efficient government services to our workers. The 24/7 hotline service will also improve and strengthen employment promotion and respond to other labor related inquiries," said Bello. He added that the DOLE Hotline 1349 is in line with the directive of President Rodrigo R. Duterte for government agencies to ensure that queries and concerns of the public will be immediately acted upon. For DOLE Hotline 1349, the inquiries include local and overseas employment opportunities, employees’ rights and benefits, working conditions, wages, labor relations, and post- employment issues, among others. Bello added that the call center is equipped with all the necessary facilities and is manned by DOLE employees who are knowledgeable enough to efficiently assist clients. The DOLE hotline service officially starts operation today, 5 September. It is manned by 10 hotline assistance officers per shift. The hotline assistance officers are required to provide the caller with the necessary information and refer the client to the appropriate agency if the request is not available. 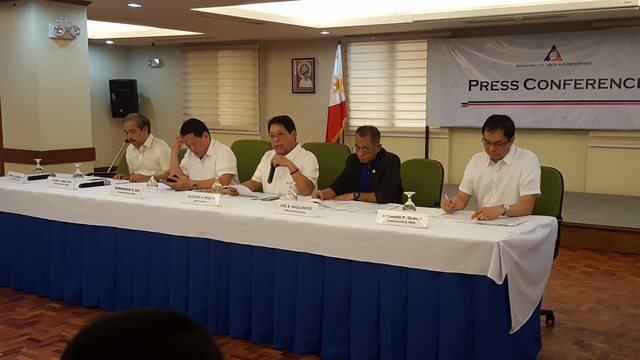 Labor and Employment Secretary Silvestre H. Bello III yesterday directed all Regional Offices of the Department to launch a massive information campaign against illegitimate contractualization and ‘endo’ practices to ensure strict implementation and enforcement of workers’ right to security of tenure. “I ordered all Regional Directors to go all out in informing the public, particularly the employers and workers, that we are serious in our target of reducing ‘endo’ practice by 50 percent by 2016 and abolishing it by 2017,” said Bello. Bello also directed the Department’s Regional Directors to double their efforts in the conduct of consultations and dialogues with workers and employers, including priority industries, where illegitimate contractualization and ‘endo’ practice is most prevalent. The priority industries include hotel and restaurant, manufacturing, health and wellness, malls, food chains, agricultural plantation, and corporate farms. He added that through the conduct of orientations, the Department would be able to clarify and address issues on the government’s efforts to end illegitimate contractualization which are being raised by various employers’ associations and other stakeholders. Bello also said that the Department is developing a frequently asked question (FAQ) pamphlet which will be disseminated nationwide. The said FAQ will also be posted in the websites of DOLE offices/agencies. “There is a need to clarify and clearly define the concept of labor only-contacting engagements, status of employment, and the instances which might lead to the circumvention of the law,” said Bello. “Labor-only contracting is prohibited. This means that labor-only contracting, or those arrangement where the contractor or subcontractor merely recruits, supplies or places workers to perform a job, work or service for a principal, is illegal,” said Bello. He added that the Department recognized that illegitimate contractualization or “endo” practices exist in both bilateral and trilateral employment relationships. “Illegitimate contractualization or ‘endo’ are practices which constitute labor-only contracting or other similar arrangements where the duration of employment is fixed for a short period for purposes of circumventing workers’ rights to security of tenure, self-organization and collective bargaining, labor standards, and other basic workers’ rights,” said Bello. Labor and Employment Secretary Silvestre H. Bello III yesterday warned the public about bogus job opportunities spread through email by an alleged overseas-based recruitment company. Bello made the announcement after the Philippine Overseas Employment Administration cautioned licensed recruitment agencies, including job applicants, about offers of overseas employment through e-mail by foreign manpower agencies. 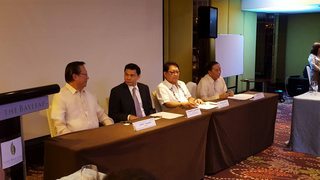 “We received information from POEA Administrator Hans Leo J. Cacdac that a certain Omegal Manpower Services Limited, claiming to be based in Ireland, is offering commissions to interested manpower brokers or individuals that can supply workers for various job openings in Canada, Mexico and Europe. We caution the public to be wary of this offer,” Bello said. According to POEA, Omegal, in its email, promises local recruiters an amount equivalent to one-month salary of every worker supplied as agency commission. “The POEA has searched the online presence of this manpower company allegedly based in Ireland, but it all turned negative. There is no such agency named Omegal Manpower Services Limited,” Bello said. POEA Administrator Cacdac also warned applicants against falling prey to unscrupulous individuals that post supposed job vacancies in fake websites and Facebook pages especially those that require immediate payment of fees. Cacdac said job applicants must ignore unsolicited emails that offer jobs in hotels and hospitals but require applicants to pay fees for testing, interview and language seminar, or visa orientation. He also advised applicants to validate the authenticity of job offers through POEA’s verification system at the website poea.gov.ph, mobile phone application, or by calling its telephone hotlines 7221144 and 7221155. Bello also invited the public to alert the DOLE of any similar illegal recruitment activities by calling DOLE hotline 1349. “We must help one another curtail the evils of illegal recruitment and human trafficking. Please inform us of any suspicious recruitment schemes happening in your places so that we can also enlist the support of other government agencies to save our jobseekers from being victimized by illegal recruiters,” Bello said. The DOLE hotline service is open 24/7 to attend not only to queries about labor and employment issues but also to other critical incidents affecting local and overseas-based workers. The Department of Labor and Employment (DOLE) conducted another Kapihan at Balitaan session this year featuring the banking and finance industry. The event was held in Midas Hotel, Roxas Boulevard, Pasay City on 14 August 2015.